Several weeks ago I received an email from a gentleman named Mike who had read several of my writings and had become interested in hunting with an Airgun. Over a brief discussion through email he had made the decision to purchase a .25 Marauder from Mac1 Airgun distributor in Gardena CA. That following week I had invited Mike to join me on a 3 day hunt in a remote area of the Mojave desert that offers not only some great Jackrabbit hunting but plenty of Ground Squirrels. The following Thursday afternoon Mike and I met in Mojave and headed another 30 miles into the deep outback of the desert that gave both our Jeeps quite the workout. We made it to an area where I had made camp on several previous occasions, good amount of shade and plenty of wood to feed a campfire. Upon arrival it was fairly windy but seemed as though it was settling down as the evening went on. I was happy to have Mike join me as I usually make many of these trips on the solo as most have to work during the week. 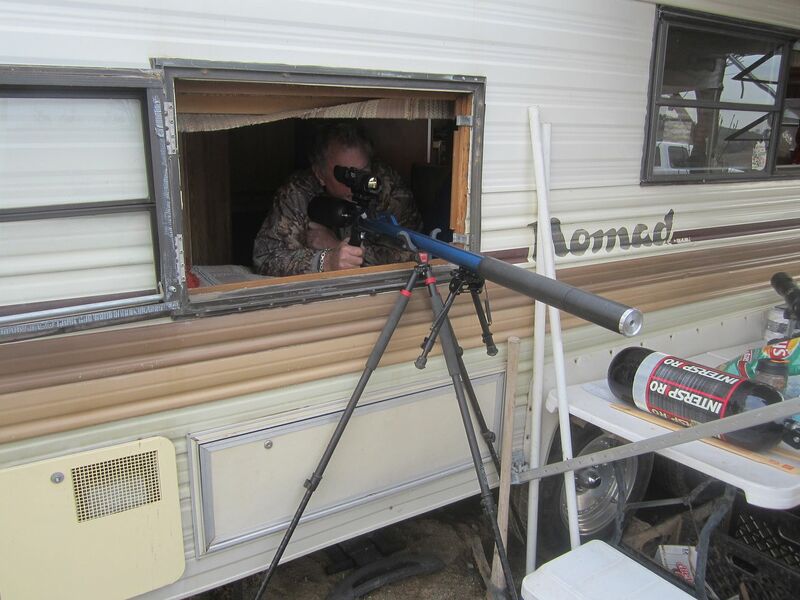 The following morning Mike and I awoke early to mount his scope and sight the .25 Marauder in at 50 yards. After sighting in the Marauder we loaded up the Jeep and headed down the road several miles to a beautiful area that has an excellent habitat for Jackrabbits. The morning was calm and clear, thankfully a bit warmer than usual that would mean the Jackrabbits would be a bit more active. As we walked towards the sun looking for the amber ears Mike was immediately able to spot some in the distance, some as far as 200 yards away. The plan was to head towards some rolling hills that would give us a better chance to not only spot them but to possibly ambush them from higher ground. We walked very slowly, trying to stay quiet that was not easy as the brush was thick in some spots. Soon upon getting to the top of this little hill Mike set his sights on a good size Jackrabbit at 65 yards, his first Jackrabbit kill, not bad for his first time hunt eh? After taking a break for a few minutes, taking some pictures and packing the Jackrabbit into my pack we continued on further through the desert. We were now in an area that had some thicker vegetation along with some Joshua trees that offered many hiding spots for Jackrabbits. I came over a hill and spotted a Jackrabbit sitting halfway up the side of a hill on what looked to be a heavily traveled animal trail, at 60 yards I made the shot right through its chest. By this time it was around 10:30 am so we headed back to our camp and packed up our things to move to a different campsite where we would spend the next few days. This area had tall grass, a fire pit along with plenty of shade to sit under and target shoot. 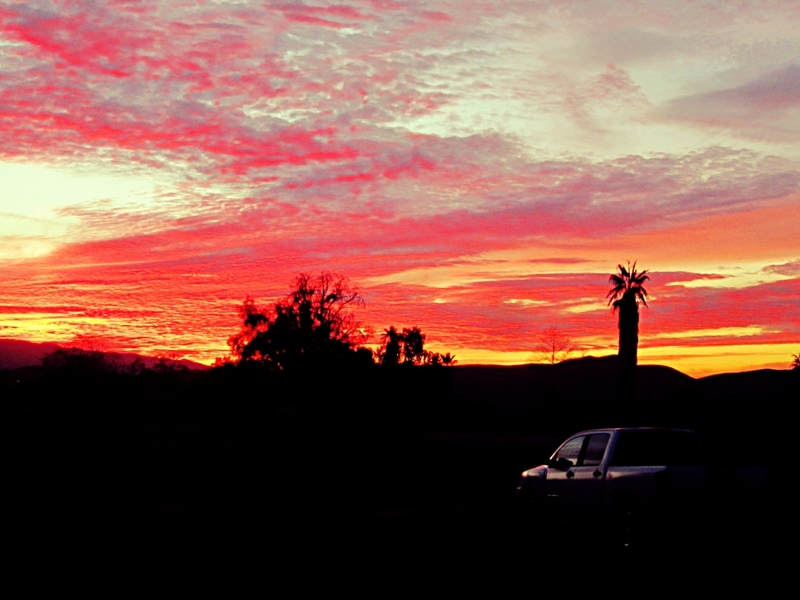 The following morning we were expecting Terry, my girlfriend Lindsey and the dog Marley to arrive to join us. After setting up camp Mike and I headed up into the rocks to hopefully find some Ground Squirrels moving about. The area has some large populations of California Ground Squirrels, the burrows are scattered about under fallen trees and in the many rocks that are just about everywhere you look. A short hike from camp set us up on top of a large flat-rock that overlooks the whole valley with several rock outcroppings just below us at near 65 yards. Mike was using a fallen log to use as a rest to steady his rifle for a shot on a Ground Squirrel that kept moving about on the rocks below us. Mike took his time and thankfully was able to keep things steady for a near perfect head-shot that put the Ground Squirrel down with authority. 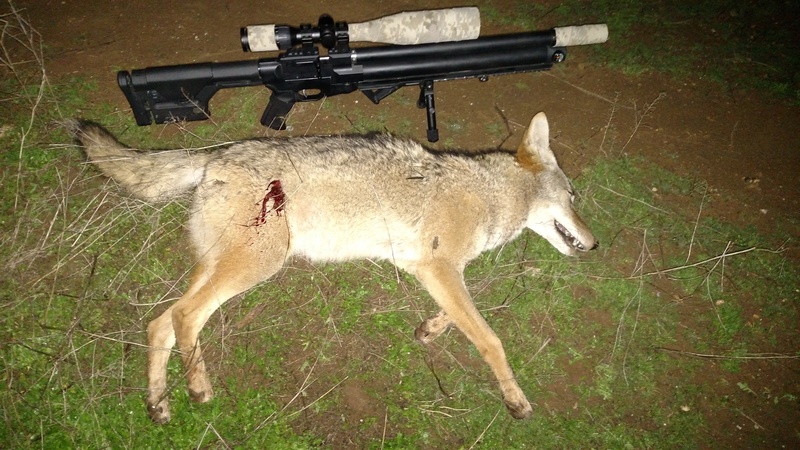 His new .25 Marauder shoots like a laser and is near the perfect budget rifle for this type of hunting. Through the rest of the morning and into the afternoon we made quite a few kills, the wind was picking up by this time. As Mike and I moved up into this canyon we could hear the distant bark of the Ground Squirrels echoing through the valley. I ended up spotting one at over 125 yards away that proved a difficult shot in the strong winds but nevertheless the perfect job for the EVOL .30 rifle. The new HAWKE Frontier 2.5-15×50 scope has really made long range shots much easier as the glass and TMX recticle are super clear. I took my time and was able to make a head-shot that entered right through the very top of the skull, dropping the Ground Squirrel instantly. After a few hours of hiking around the Oak Tree covered valley Mike and I headed back to our campsite to set up for the evening and to gather some firewood to get us through the night. The wind was picking up again, gusting as high at 35/40 mph, no fun when trying to set up camp. That evening we made a great campfire and were able to relax under the stars and enjoy some good conversation. Mike and I had cleaned and processed our Jackrabbit kills earlier that day and had planned to have them for dinner, although we thought we would wait till the next evening to share with the others. Mike made us some Top Ramen that tasted excellent, and too being a great way to get warmed up as it was by now a bit cold out. Both Mike and I were quite tired and sore from a full day of hiking, must have put in near 8 miles up and down through the valley. Getting to sleep was no problem at all so we called it a night and planned to get up early to wait for Terry, Lindsey and Marley to arrive by 8:30 am. The morning was quite calm with a slight breeze that we had hoped would stay that way for the rest of the day, at least long enough to get some hunting in. At about 8:45 as I sat with my rifle looking up into the nearby rocks that towered above our campsite, I could hear the distant sound of a vehicle breaking traction coming up the rugged rutted out road that lead to our spot. My favorite little companion Marley immediately came to greet me and was very surprised to see me being she wasn’t to sure where she was going at 4:30 am. This was Lindsey’s first time in the area and had came along to do a bit of Rockhounding (video link) , a hobby that we both share. This area had a large abundance of quartz that she had hoped to find plenty of that evening when we headed back down to hunt Jackrabbits. Terry set up a nice little range with several targets between 50 and 77 yards for us to use and fine tune our guns, he even brought a chronograph. After about an hour of so of shooting our rifles we decided to head out up a trail that headed out of camp and into the nearby rock outcroppings. We each set ourselves up in different areas about 50 yards apart each facing towards the rocks that had many Ground Squirrels that would frequently venture out to sun themselves. Terry set himself up against a rock that offered good cover along with shots between 45/75 yards. Soon we could hear the distant THWACK of the obvious lead therapy that Terry was giving a nearby Ground Squirrel at 75 yards. I had sat under a large Oak Tree where I spotted several Ground Squirrels moving about through the crevices of some large boulders. I was waiting for one of them to climb higher on the rocks making for a more clear shot. After about 20 minutes of waiting I finally spotted one that climbed up and was sitting still trying to get some sun. This shot was at 115 yards and would not be easy due to the pretty strong cross wind that I was sure would carry the pellet way to the right. With a guess in calculation I moved my shot 1.5 mil to the left, not as much as I needed but still enough to make a bone crunching gut shot. After some time hiking around we all headed back to camp where we had lunch and relaxed for a bit, frequently shooting at several Ground Squirrels that were in the nearby rocks. After a few more hours of goofing off in camp we all had decided to head down the road and make the long hike across the desert to an area I had spotted a good amount of quartz crystals and a super great area to hunt Jackrabbits. I figured by the time we made it out to the area it would be the perfect time to pick a spot to sit and wait for some Jackrabbits to come by. The sun was coming down pretty hard on us and we still had a ways to go before we would be near any type of shade. Lindsey was happy just to be out doing some rock hounding in such a beautiful location. As we walked we soon spotted several Jackrabbits that were well out of range, but they all looked to be very near where we were headed. After another 20 minutes of hiking Lindsey, Marley and I arrived to the spot that I had described with many quartz crystals and great habitat for Jackrabbits. After a short break in the shade Lindsey got to work and headed out to explore the grounds for the many assortments of rocks the place had. Terry and Mike headed further out past where Lindsey, Marley and I were and I could hear the distant shots they were making as pellets were tearing through the thick brush. After several minutes of sitting I spotted a Jackrabbit at 80+ yards across a ravine that was partially obscured from a Cholla Cactus. I took a head-shot and ended up shooting a bit to high sending the pellet right through the side of one ear that dazed it just long enough for Marley to get close enough to flip the Jackrabbit in the air. I ran across the ravine and watched Marley chase the Jackrabbit, she nearly got it too just as they both ran by Terry. That little dog is simply the best hunting dog I have ever seen, a pure natural hunter. After all the excitement I headed back over to check out what Lindsey was up to, she was doing a bit of rock stacking with the few larger pieces of quartz. For those of you who don’t know, Lindsey is the real backbone of the online magazine mountainsportairguns.com and does many things for the Airgun community behind the scenes. She is responsible for many of the popular Airgun industry websites many of us frequent on a regular basis. Anyone reading this who may need some serious website work, mygirlfriday805 is the best in the business and truly an amazing part of my life. After several hours with no luck getting many shots on Jackrabbits we made the slow journey back to the truck, I say slow because I had about 100 lbs of rocks in my backpack. We arrived back to camp just in time to watch the sunset and to get a fire started along with the portable BBQ Terry had brought to cook on. Between all of us we had a good amount of food that we had all brought to cook, hotdogs, carne asada, snacks, drinks and even hot chocolate and beer. We were all very hungry from the long day of marching through the desert, even Marley was ready for anything she could get her paws on. After stuffing ourselves with mass quantities of food we were all near comatose and ready to just go to sleep. The plan was for us guys to get up super early and head down the hill again to try for some Jackrabbits for a few hours. We all slept pretty good that night, I felt pretty refreshed the next morning at 6:30 am and was ready for some more hunting. We headed down the hill and excitedly made our way back into the same area we hunted the evening before. It was a beautiful morning that thankfully wasn’t windy at all, wish the last few days had been that calm. After about 30 minutes I finally spotted a Jackrabbit at 45 yards that was sitting under a bush taking in the warm morning sunshine. Notice in the photograph I was wearing jeans, well the day before I had gotten a small tear in my hunting pants that ultimately worked into a larger tear that ripped the whole pant leg off. Happy I had brought some extra pants, otherwise I would be chasing Jackrabbits in my underwear. Not a pleasant sight I can assure you! As the morning moved on I spent some time stalking Terry hoping to get some shots captured on camera, he was quite hard to spot among the dense desert foliage. As all four of us hiked towards the nearby mountains the plan was to circle around and cross over a road into a new area I had never hunted before. Marley and I set out ahead and crossed the road almost immediately seeing several very large Jackrabbits moving through the brush on the hillsides. This area was near perfect terrain for Airgun hunting as it offered good opportunities to get close having so many trees to hide behind as we moved closer. I could hear Terry and Mike both making shots on running Jackrabbits, Marley was getting supper riled up as she listened for that distinctive THWAP!! 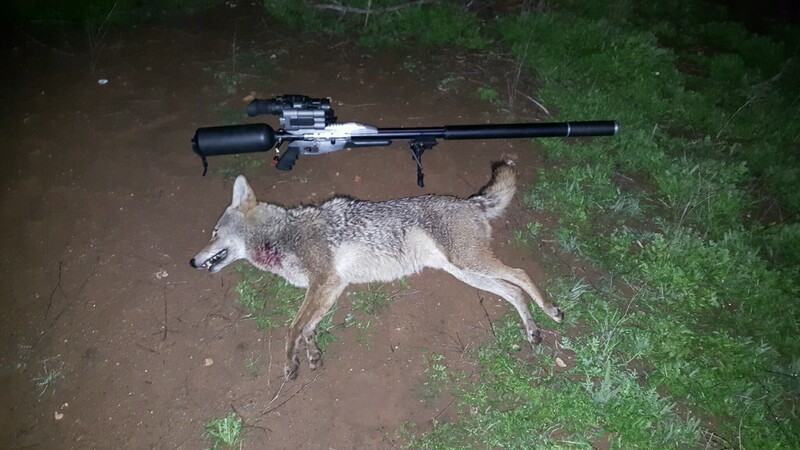 As Marley and I moved around a bush I attempted making a shot on this Jack that was sitting facing us at 200+ yards, made a shot that came up short right next to its feet sending it into a full sprint out of sight. Over the next hour all four of us tried stalking several Jackrabbits, the one I was after went up a hill and over a rise down into some more open area. Marley and I slowly made our way up the hill with the hopes to ambush the Jackrabbit from above, when hunting them I always have good luck hunting down on them when possible. As we made our way over the crest of the hill I immediately spotted the Jackrabbit sitting under a large bush with its back facing me, perfect shoulder shot at 95 yards. The .30 EVOL is in my opinion the perfect all day gun for hunting Jackrabbits, with plenty of power and 40 regulated shots at 85 fpe it packs a mean whallop. As I made my last kill of the day I packed them neatly into my back and ventured back to the truck where where Terry and Mike soon joined. This few days of hunting was no doubt a good amount of work but well worth the effort to be able to share it with a newcomer to the sport. I commend Mike for reaching out and not being afraid to ask questions and take advice, It was a true privilege to have him join me and to be able to witness his first Jackrabbit kill. It’s very important for us as Airgunners to keep the sport alive and to help it grow in a positive way, Mikes story is a great example. Enclosed is a video documentary of our trip, enjoy!